After a busy summer so far we finally made a start on our Summer Bucket List for 2015! A trip to Glasnevin Cemetery for the infamous tour and a walk through the museum was top of my list - ever since I watched the fascinating documentary One Million Dubliners last year. The knowledge, passion and vivaciousness of the Historian/Tour Guide Shane MacThomais came right through my TV screen and hooked me right in. It was a fascinating and very emotional documentary I found and I was very saddened to hear that he himself passed away some time after it was originally made. And so it was that earlier this week that we found ourselves starting our tour at Daniel O'Connell's final resting place, a decorous crypt that we got inside to view and his coffin that we got to touch - for luck apparently - led by our tour guide. Brigid also featured in the above documentary and I found her to be equally as knowledgeable and passionate about, not just her job, but the whole ethos of Glasnevin Trust. The woman never stopped talking, she had so much information and quirky stories to impart. She was fantastic! 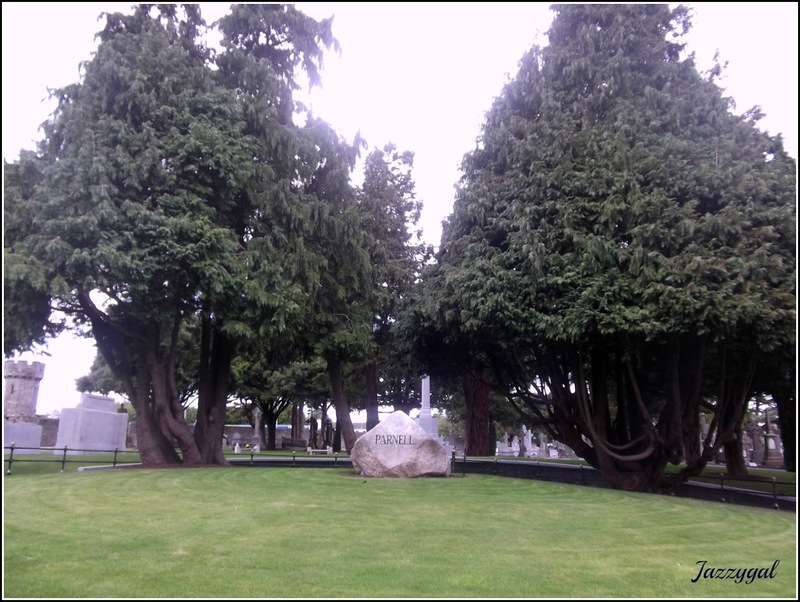 It was fit and proper that we started at 'The Emancipator' Daniel O'Connell's grave - he who founded Glasnevin Cemetery, which was the first non-denominational cemetery in Ireland. Both facts I never knew. 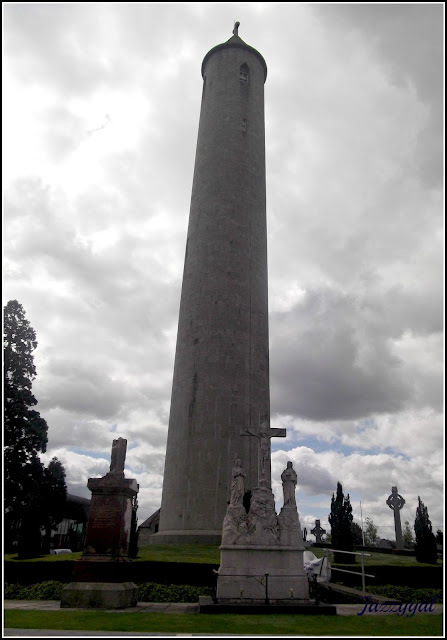 His decorous crypt lays very close to the O'Connell Tower, built in his honour, which at 51 metres high affords fabulous views of areas far beyond Dublin. Well, at least it did until a bomb in 1971 destroyed the internal staircase. Glasnevin Trust fervently wishes to replace this staircase, Shane Mac Thomais was also very committed to this, so that people may once more make that long climb to the top. To do so though they need funds. Wouldn't it be great if our Government, or our National Lotto even, stepped in to assist? From there it was down this beautiful Victorian Avenue, lined with deep green Yew trees, where lots more tales of burials of the poor and victims of disease and Grave Robbers - apparently there were none here thanks to the Watchtowers and Cuban Bloodhounds - etc were imparted, to arrive at the final burial place of Charles Stewart Parnell, who rests in the Cholera Circle. Not because he died from cholera you understand, there are reasons for this! His funeral was so massive that Glasnevin Cemetery practically had a riot on their hands. How future celebrity funerals were to be conducted were influenced by events that day and these days it is ticket-holder only! From there we visited more graves - including the comparatively diminutive grave of our former President Éamon De Valera, for which there are also reasons - before arriving at the second last grave on our tour that day, that of Jeremiah O'Donovan Rossa. And here I learned even more history that I'd forgotten. Two days after our tour we would see this grave side on our TV screens as the Centenary commemorations of The 1916 Rising started here with the re-enactment of this funeral. The commemoration events will apparently end next year back in Glasnevin Cemetery at the final resting place of Daniel O'Connell. Evidence of the firm place this cemetery holds in Irish history. Of course the final resting place we visited was that of Michael Collins, also world-renowned and we heard more stories of his escapades that definitely didn't make it into our school books! And even at rest this man has his admirers with many leaving cards, flowers and letters when they visit. And apparently his long-time, regularly visiting, French admirer now has a rival! Oh, we visited many other graves on our tour this week and heard many more anecdotes; but you'll have to take the tour to hear them for yourselves! 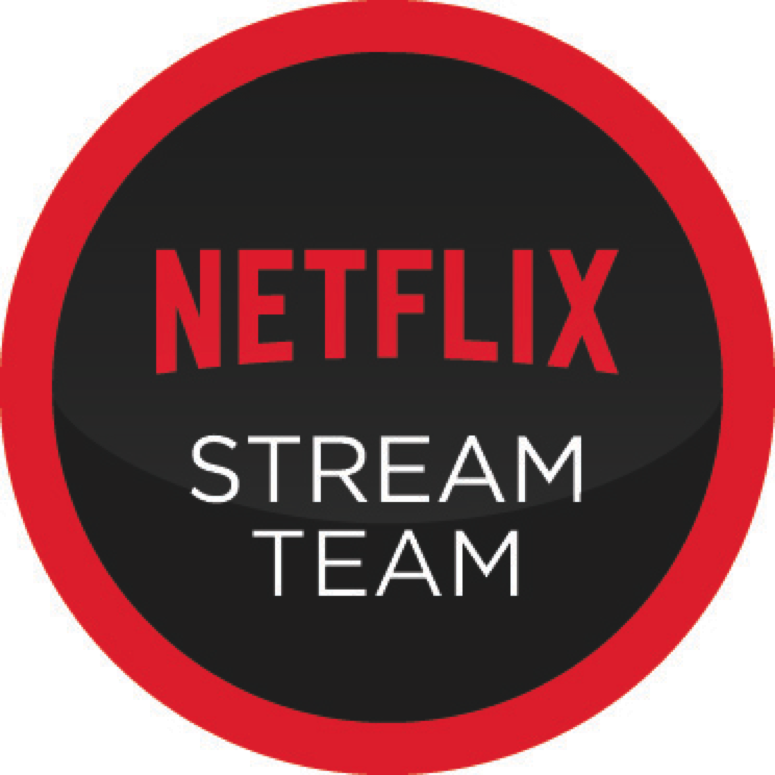 I really do recommend it. This tour is an express lesson in Irish History and includes anecdotes you will never get from a history book. There was so much I'd forgotten from my school days. 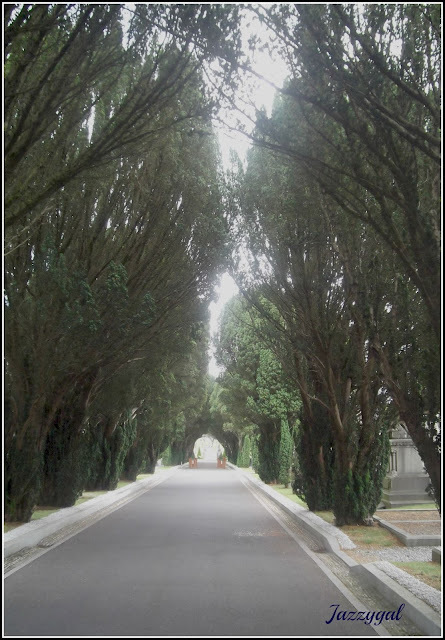 We were also told that one-and-a-half million souls are presently resting in Glasnevin Cemetery - more than are walking around Dublin. Of that number more than 800,000 are in unmarked graves; pauper graves and the graves of people who died from diseases like Cholera and victims of The Famine, the biggest tragedy to hit our nation. There are people buried in mass graves - 14 buried per day on average in one grave during The Famine times - who bear no relation to one another. 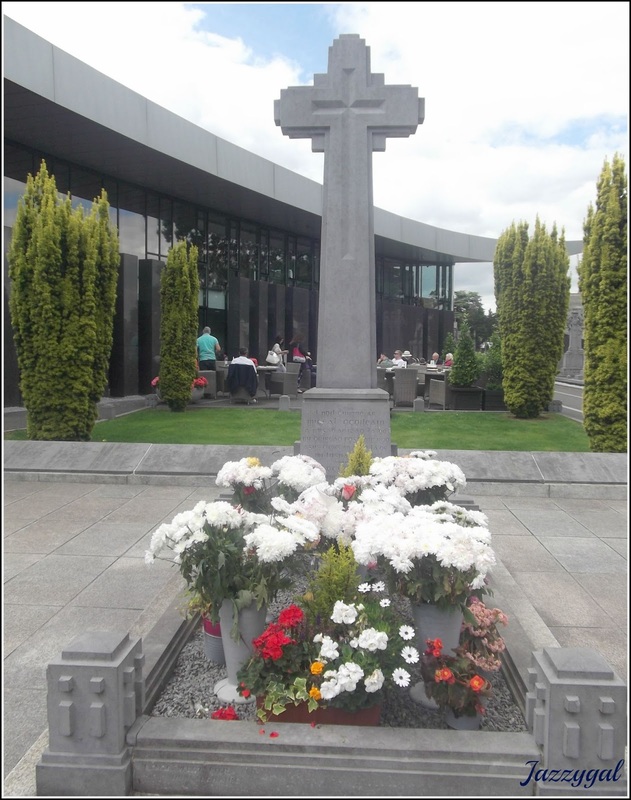 They may not have marked graves but Glasnevin Cemetery has a record of each and every soul buried there. How much they care about all buried here really came across on our tour. Their detailed care and attention has also been noted abroad and last December Concern got in touch to seek advice on how to record the mass deaths occurring from Ebola in Liberia. Do you know something, we really are a country steeped in such fascinating, and devastating, history. I wonder how more recent political events, and the people involved in them, will be viewed in years to come through burials at this cemetery; and what people taking this tour, or watching TV documentaries, will make of them? This tour is ideal for older children and teenagers, and you save money if you book online! There is no signage from the M50 exit (that I noticed) so just stay on the N2 - learning from my mistake and by-passing the exit to Finglas Village! - until you eventually see this massive graveyard on your left and the sign for the car park to your right. @magnumlady: Oh you should definitely go, your photos will be amazing!